A Tidey picture (T900). The loco is suggested as either no. 1782 or no. 1581 and the location is suggested as being near to Farington, but John is sure it is not. An alternative thought is north of Rugby which is not a usual haunt of Tidey. The train is said to be a Down goods. There are signals on either side of the bridge and there seems to be a small signal box through the right hand arch. The embankment appears to be deepening. Any thoughts on the location anyone? I do not think this is Farington. We have numerous views of that area to think otherwise. A guess, and it is no more than that is an up train passing through Tring Cutting. Although the sides of the cutting in the print do not look quite steep enough, could it be on the approaches to same? The cutting looks to be fairly long and deep. If this is north of Rugby I think this would have to be OB11 at Easenhall circa 86M 1400Y. As this is the only arched overbridge between Rugby Trent Valley Junction, and Brinklow where the four line section ends. The bridge at Easenhall also has a retaining wall under the western arch, and the cutting gets wider to the south of the bridge, both of which I think I can see in the picture. However I am not sure if the details are quite right, this may just be a bridge that looks a bit like Easenhall. The rings on the signal arms tell us that the furthermost track is a Slow Line, and the tall posts with co-acting "sky" arms imply a high-speed location. There are no signals suggesting facing points. The small signal cabin appears to be on the far side, that is, adjacent to the Slow line. The only location I can find which fits this and the topography is Wrine Hill, between Betley Road and Madeley. The signal cabin here was positioned adjacent to the Down Slow line. In that case the track layout is DS/US/DF/UF and the train is running on the Up Fast line - not a "Down Goods". The overbridge would be Checkley Lane. Wrine Hill was a simple break-section cabin without any points. It opened only for limited hours, which is consistent with all the visible signal arms being "off". It closed entirely on 25/10/59 and as I recall was disused for some time previously. Betley Road cabin was 1 mile 186 yards distant - a long pull for a distant signal but maybe worked by two levers, as on some other locations on the LNWR. The down direction at Wrine Hill was of course a racing ground, with a gradient of 1 in 177 falling towards Crewe. The engine appears to be working hard (but not travelling fast) on the rising gradient. Google's satellite seems consistent with this location. The overbridge may still exist as it appears to have ample clearances for the 1960s electrification. The loco carries the headlamp code for Fish, Meat or Fruit train composed of goods stock, Express Cattle, or Express Goods train, and appears to have at least a fitted "head". This is also consistent with the train travelling on the Fast line. Another possibility I considered but rejected was Carwardine Cutting, between Armitage and Rugeley, another simple break-section box with no points, positioned on the Up side, which closed in September 1957. Here the track layout was US/UF/DF/DS in which case the train is running on the Down Slow line, consistent with a "Down Goods". However, I have to say that Google does not reveal an overbridge at or near that point! The overbridge is very similar in design to the Bee Lane bridge at Farington Curve Junction, but the signal cabin and other details do not fit. While that building seen on the far side of the tracks through the right-hand arch looks like a signal cabin (with the light coming from the left, perhaps suggesting the train is heading south) there seems to be another(?) cabin just beyond the bridge-pier immediately to its left. There's certainly a building of some sort there, with projections which could be platforms below the windows on each side. The track with the train would be to its right, with the other three tracks to its left. If it is a signal cabin would this fit some location with four tracks and an overbridge with three brick arches? My identification of the location as Wrine Hill is (alas) totally spoiled by the discovery that Checkley Lane was an underbridge. In fact the location is quite definitely Farington Curve Junction (not the same thing as Farington), the bridge is Bee Lane and the silhouette of the signal box (which I visited several times circa1960) is visible behind the bridge pier. The photo was taken right by milepost 20 and the shallow cutting hiding the Blackburn/Liverpool line is visible on the left. There are no signals visible for these lines as they were positioned further back, in rear of the junction. Signal arms for the facing junction from Up Slow to Blackburn and Liverpool are almost concealed by the bridge, but their tops are just visible above the parapet. The rather odd 'A' shaped telegraph poles are visible on many other photos at this location. The thing that deceived me is what appears to be a Type 4 signal cabin in the background, adjacent to the slow line. I am quite unable to say what this actually was, unless it is the remains of an earlier signal cabin retained as a store or platelayers' cabin. It cannot possibly be Skew Bridge cabin which was 763 yards away and preceded by a forest of signals. Farington Curve Junction was Type 4 and opened in July 1891, so had existed for thirty years at the date of the Tidey photo. The train is of course running on the Up Fast Line, and previous comments still apply. It is tempting to identify the train as the 0745 "Maltese Cross" express goods from Carlisle to London, Preston pass 11.32, Euxton Junction pass 11.45, booked to run Fast Line. Well done, Philip! So there are two tracks through the right-hand arch, not one as I'd assumed. The placename Farington, confusingly, seems to cover a lot of ground. On the OS 1" map (1961) the name appears twice. Firstly, close by the site of Farington station, and again, across open fields one and a half miles south, as the name of a district in Leyland. This isn't simply some dozy cartographer's mistake, because this same weird double-naming appears on earlier maps. 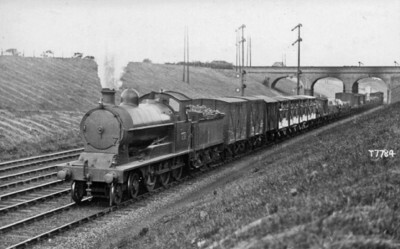 H. Gordon Tidey described several of his photographs as "near Farington", including those taken at Euxton Coal Sidings box, over three miles south of Farington Curve Jct. Maybe he was staying at Farington when he took his pictures, and somehow overlooked Leyland, whose station lies between Farington and Euxton. Or maybe he was working from memory, years later and far away from darkest Lancashire. As a follow up, my July 1921 WTT shows the 0745 ex-Carlisle "Maltese Cross" goods as running only as far as Crewe, Preston pass 1159, Euxton Junction pass 1213, booked to run Slow Line (there was an LYR passenger train for Bolton running on the Fast Line, also booked to pass Euxton Junction at 1213). The July 1922 WTT shows the train as destination London, and retimed to pass Preston 1132, Euxton Junction pass 1145, booked to run Fast Line. There are no other trains which seem to be even remotely possible candidates. So it would appear that the Tidey photo was taken in the late summer (scythed grass on the embankments) of 1922. Furthermore, I believe that the photo was taken on a Sunday, when both Farington Curve Junction and Skew Bridge were switched out (and all signal arms pulled off). The 0745 ex-Carlisle ran Tuesday - Sunday. Examination of the timetable reveals no trains on the Up Slow/Down Slow/ Down Fast lines (let alone on all of them) scheduled at around the time this train would pass on any day of the week (if more-or-less on time), so I conclude that Farington Curve Junction is switched out. In fact the 1922 timetable was quite sparse compared to BR days. Tidey would have had to wait until 1335 for the next train on the Up Slow and 1405 for the next train on the Up Fast. The first two vans are LNWR, the third is GWR, and the cattle trucks are LNWR. This does not look like Easenhall Bridge (Br 10) the signals and the 'box' shown in the photograph don't appear to agree with records. I am not aware of signals near Easenhall Bridge but as David says it has a retaining wall. There are also overbridges at Parkfield Road, High Oaks (Br 8) Cathiron Lane (Bridge 9B as described in the Journal for Dec 2009) and Easenhall. High Oaks could be a contender but I'd need a trip out to check that it is the right sort of bridge. However, likewise the signals and box are 'wrong'. I have had the 'pleasure' of working on the railway between Brinklow and Rugby and walked this length of line on a number of occasions. I'm not convinced that this is near Rugby on the Trent Valley line but I could be wrong. "The place name Farington, confusingly, seems to cover a lot of ground". According to my maps, Bee Lane is very firmly in Penwortham. I think that the junction was called Farington Curve Junction meaning "the junction (at nowhere in particular) for the line (none of which was in Farington) connecting with the already-existing Farington Curve at Lostock Hall" rather than "the junction at Farington controlling the curve line to Lostock Hall" which of course was Farington Junction. A sort-of-analogy - Crewe Junction (Shrewsbury) was not at Crewe. There was already a Penwortham Junction on the LYR, and of course all this area was open fields and "Farington Moss" when the lines were built. At one time there were four signal cabins at Farington, later consolidated into one. I see that there is an estate of modern detached houses located in the loop of the curve line called North Union View. I wonder if the inhabitants realise the significance of the name? I noted this mystery photo 102 was thought to be taken by Gordon Tidey in 1922. I am not so sure about that - from the leading D87 or 88 van it must be after 1904 but the cattle wagons have white limewash on their lower sides, and I thought use of limewash was banned after 1911 as being injurious to the animals, so 1922 must be in doubt. Limewash (whitewash) was not prohibited until 1922/3, possibly not until LMS days. See for example GWR Goods Wagons, plate 561, "GWR Cattle Wagon 13983 officially photographed in 1922". This book says that "whitewash was banned by Statutory Instrument in the early 1920s" (no exact date given). The photo number is T7784, and I don't think that H.G. Tidey was active before WW1! As it happens I had this discussion very recently on another site, prior to painting a model cattle wagon that I�ve just built. It was pointed out to me that Midland Railway Journal no.30 has a photo said to date from 1933 showing 10 cattle wagons of various different designs, all of which show no sign of limewash BUT also one MR cattle wagon which looks to have had a generous application of whitewash on its floor and around the bottom of the doors. Peter Ellis also reminded me of a J.P. Richards photo taken in 1923/4 of an LNWR cattle wagon plastered in the stuff! How did you arrive at the date 1911 Chris, and was it one of those RCH directives like banning dumb buffers or providing brakes on both sides which wasn't actually achieved for many more years? The number T7784 was that given by Real Photographs sometime after 1960. These late numbers bear no relationship to date of picture, and indeed by no means all of his pictures were absorbed into that series. Some are in private hands while quite a few remained in the Locomotive Publishing Co's pictures. Tidey's own number was T900, and the date I have noted for the picture is 1922 which ties in with other numbers in that area. T878 for instance is known to have been taken on 3/9/1922, showing GNR no. 1471 on a trial run. Tidey was active well before the first war with a number of his pictures published in Railway & Travel Monthly from 1910. It is believed that he was taking pictures by 1900 (he was born in 1879). He started his "T" number series for moving trains and "S" series for stationary engines etc about 1910. Earlier pictures, which are mostly engines, are numbered in the "A" series while the "C" series are copies (of his own pictures in most cases). It may be that he had his first camera good enough for moving trains at that time. Limewash is a caustic killer of pathogens and not to be confused with whitewash, which is just a thick paint used on coarse textures, such as stone or timber. Its use was abandoned by the railways in 1923-24 (although the first steps may have been taken in 1922), towards the end of a severe and prolonged outbreak of foot and mouth disease. It was replaced by a low concentration of phenol (carbolic acid). Parliament did not ban the use of limewash until 1927 in a new �Transit of Animals� Act, effectively rubber-stamping what had already been effected. The estimated date of this picture as 1922 is thus plausible. I might add that in that position in the train, the cattle trucks would have been empty and part of a positioning move. I had overlooked this one until now, but Steve's post drew my attention to it. I am totally convinced by Philip's explanation of the place, and the date. https://www.old-maps.co.uk/#/Map/353761/426459/12/100674 and apparently did not change significantly from 1893 until the 1930s. (the OS did not survey the area at 1:2500 scale until c1890, apparently). Farington Curve Junction SB is the silhouette behind the bridge pier. The junction from Slow lines to L&Y was right next to the bridge, and would be behind the cattle wagons. I have to say that I did not at first notice the low slope in front of the higher cutting aside, but once you know it's there it's obvious! The building next to the Down Slow in the distance must be a p w hut. It is shown on the OS plan several hundred yards beyond the bridge, which must be right.